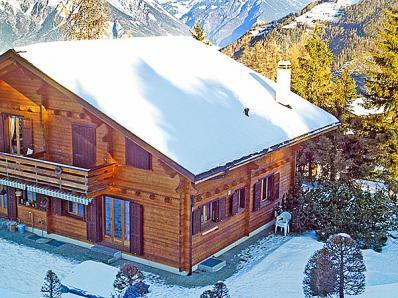 Well equipped three storey Valais-style chalet with open fire place and free WiFi. Friendly living room with lounge. Modern open plan kitchen with spacious dining area and access to the terrace. The chalet is situated on the outskirts of La Tzoumaz, ~500 m distance to the village centre with supermarket, sport shops, ski rental, restaurants, cafés, après-ski pubs, childcare facilities, post office, bank and beauty salon. The other house of this double chalet (right part of the duplex) is not accessible for the tenants. Distance to the ski area (connection with Verbier - 4 Vallées) approx. 850 m. We recommend taking the ski bus (bus stop ~30 m) which is free of charge and runs regularly. The ski school, ice skating rink and indoor pool with sauna is located next to the cable car station. altitude chalet 1.500 m; top of the ski slopes 3.330 m on the Mt Fort glacier. ; 410 km of alpine slopes, 95 ski lifts, biggest swiss ski area. 10 km sledge run, accessible via cable car.